Around 200,000 homes are connected to the gas network. There are many homes which could connect to gas and with the gas network expanding more people will soon have the choice to connect as well. I already use gas – can I switch supplier? Can I connect to gas and is it worth doing? ‘PowertoSwitch’ provides the information to help you know more about both areas! For homes already on gas you can compare across all gas suppliers and tariffs (although not everyone can switch supplier at the moment). PowertoSwitch provides information on the gas network, how to connect and what this could cost. You can check if gas is available where you live and compare the cost of heating your home with gas compared to home heating oil. Domestic consumers in the Greater Belfast and Larne area can choose from two suppliers: firmus energy and SSE Airtricity. PowertoSwitch can quickly and easily find the best deal for you and help you switch. In the Ten Towns area domestic customers can only be supplied by firmus energy. Other companies are now allowed to enter the market and provide choice – PowertoSwitch will keep an eye on this and update our site when new suppliers and deals become available. When you switch there are no any changes to your meter or your pipework. If you change your mind you can cancel the switch up to ten working days after registering. The switch should be completed within 15 working days after the end of the cooling off period. Be sure to check out Switchadvisor to read the experiences of other consumers who have switched and how they rate their new supplier – don’t forget to add your own views! Can my home connect to natural gas? Phoenix Natural Gas (PNG) operate the natural gas network in the Greater Belfast and Larne area. Gas is readily available to around 90 percent of homes in the PNG licence area. 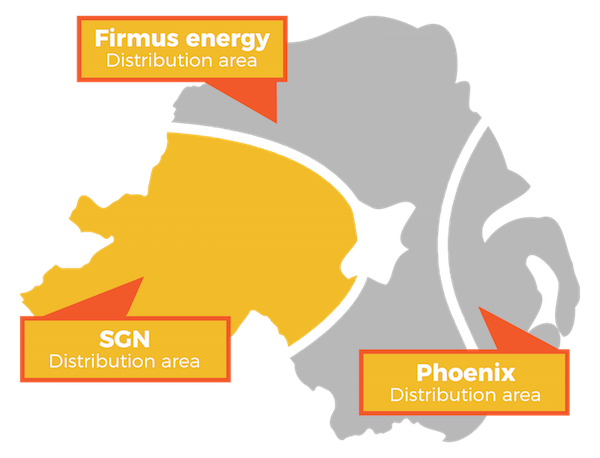 firmus energy operate the ‘ten towns’ network. This includes Londonderry/Derry, Limavady, Ballymena, Ballymoney, Coleraine, Newry, Craigavon, Antrim, Bainbridge and Armagh – new areas are being added as the network continues to expand. SGN Natural Gas operate ‘Gas to the West’ which over the next few years will be bringing natural gas to Coalisland, Cookstown, Dungannon, Magherafelt, Omagh, Enniskillen, Strabane and Derrylin. Each company offers a range of support, such as free connections, to help homes connect to the gas network. The Energy Advice Centre provides information on other grants and assistance available to help with the cost. Although price will often be the most important issue for many people it is worth considering any other services your energy supplier can provide. Energy companies not only compete on price but also standards of service and additional features and innovations to help improve your overall experience. Take a look at some of the different products and services offered by each gas supplier. Energy companies provide a range of support to help vulnerable consumers. You may be vulnerable if you are a pensioner, disabled or chronically ill. For more information on support for vulnerable consumers read our guide. All gas suppliers have a Customer Care Register. This has the details and needs of their customers who are vulnerable. Suppliers will provide assistance and specific support to customers who register their details with them. The list of services offered by each gas supply company is listed in the tables below along with contact details so you can get on the register.